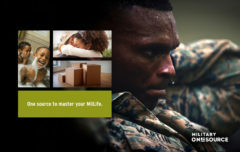 Military OneSource provides service members and their families with information and resources to help master military life. With 24/7 access by phone or online, our nation’s guardians have a trusted source for support and answers on health & well-being, financial readiness, family life and much more. But too many service members and their families were not taking advantage of this important resource. It was time to revive the Military OneSource brand. Research showed that our military audience is strong and resilient. They accomplish incredible tasks every day. We created a new brand voice and visual identity to reflect that strength and represent the brand in a more emotional, authentic way. What’s most important to service members and their spouses is their role as guardians of both country and their families. We captured that key motivator with the MilParent Power outreach campaign – helping military parents take their parenting skills to the next level. Promotional posters and fliers help inform and connect with target audiences. Relevant, authentic social content engages the military community on multiple social platforms. Engaging motion graphics bring the campaign to life. We captured the essence of the brand with a revitalized campaign for its financial counseling and free tax services. Military OneSource helps this audience do more than simply file their taxes – they can power through complex questions and take advantage of hidden benefits and tax savings. Moves are common in the military. Every two to three years, families relocate during a Permanent Change of Station (PCS). Our content strategy shifted away from the challenges to focus on discovery and success in a new chapter in life – Mastering Your PCS. 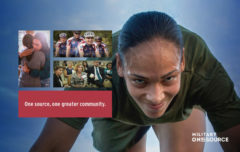 Ensuring the military community has the right information and resources is mission critical. Every month our team develops, curates, and publishes more than 500 pieces of new content for multiple websites, eNewsletters and 10 social media platforms. 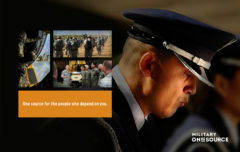 We create materials and displays, host webinars and conduct live events, all designed to create a holistic Military OneSource brand experience through multiple touch points. All service branches (Army, Marines, Navy, Air Force) report more widespread use of campaign materials. The size of the overall social media community has increased dramatically. The MilTax campaign drove a 40% increase in web visits and a 21% increase in tax counseling sessions.